When my purse was stolen from my Brentwood driveway, I had to replace my driver’s license. I was dreading the long wait in line at the DMV…with two kids in tow. THANK GOODNESS my sister told me about the DMV Express Station in downtown Nashville. You can renew or replace your driver’s license at any Tennessee DMV. 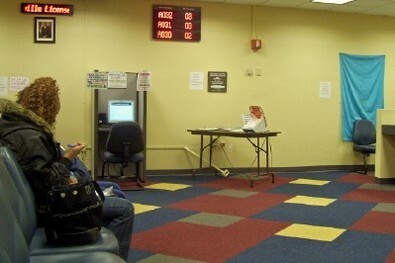 But one special DMV is set up only for renewals and replacements! You won’t have to wait in line with teenagers taking their first driving tests and immigrants looking for identification cards. 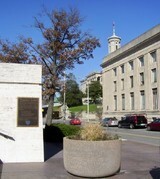 You’ll need to head to downtown Nashville, near the State Capitol building at Charlotte Avenue. 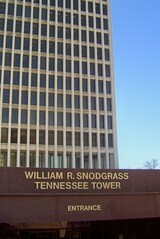 The Express DMV is located in the bottom of the Snodgrass Tennessee Tower between 7th and 8th Avenues. Parking is truly the only obstacle. There are metered spaces along the street, but my husband drove a few blocks over and waited for me. When you enter the Express DMV, grab a ticket — and a clipboard. You will fill out your form as you wait. When your number is called, a clerk will enter your information in the computer. Then you’ll wait a little while longer until the next batch of photos are ready to be taken. Before you know it, you’ll be sitting in front of the blue backdrop for your new driver’s license photo! Start to finish, my new Tennessee drivers license took about 25 minutes — but that was mainly because only one desk was open at lunchtime. Clerk Detrick Fuchs handled the room quickly and with courtesy. My sister says that her driver’s license only took about 15 minutes to renew on a normal workday. If you are using a credit card, you can go through the electronic kiosk even quicker. If you have questions about renewing or replacing your Tennessee driver license, contact the Tennessee Dept. of Safety directly at 1-866-849-3548. NOTE: Brentwood, Tennessee does not have its own Driver License Center. The closest testing station is located in Franklin at 3830 Carothers Parkway. Do you have to renew your license if you move within Williamson County?